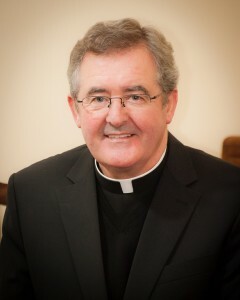 Canon William Crean was Ordained the 67th Bishop of Cloyne at St.Colman’s Cathedral, Cobh today (Sunday, January 27, 2013). The Principal Ordaining Bishop was Archbishop Charles Brown, Papal Nuncio to Ireland, assisted by the Archbishop of Cashel & Emly, Most Reverend Dermot Clifford DD and the Bishop of Kerry, Most Reverend William Murphy DD. His Eminence Sean Cardinal Brady, Archbishop of Armagh and Primate of All Ireland presided at the Mass, and concelebrants included the Archbishop of Tuam, Archbishop Michael Neary, many other members of the Hierarchy, some 90 priests from the Diocese of Cloyne and a large number of priests from the new Bishop’s native Diocese of Kerry. Classmates of Bishop Crean, including Bishop Noel Treanor, Bishop of Down and Connor, also concelebrated the Mass. Members of Bishop Crean’s family, including his seven brothers and sisters, were in St. Colman’s for the Ordination. The official document from Pope Benedict XVI appointing Bishop Crean was read by Msgr. Eamonn Goold PP VF, Midleton. The first reading was read by Colm Drinan, Carrigtwohill and the second reading was read by Maire Ui Laoire, Cill na Marta. The Psalmist was Eileen Plummer, a member of the Cobh Cathedral Choir. The Gospel was proclaimed by Fr Damien Lynch, CC Fermoy, who was ordained to the priesthood last June. Offertory gifts were brought forward by children from the five Cobh parish schools. 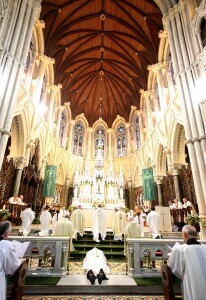 The choir was made up of the Cobh Cathedral Choir and St Colman’s Chamber Choir. Director of Music was Mr Dominic Finn. The organist was Mr Adrian Gebruers, who is also the Cathedral Carilloneur, and played the Carillon as the procession left the Cathedral at the end of the ceremony. Representatives of other Christian Churches who greeted the new bishop included the Right Reverend Paul Colton, Bishop of Cork, Cloyne and Ross, the Church of Ireland; the Reverend Colin Milligan, the Methodist Church of Ireland; the Reverend William Montgomery, the Presbyterian Church in Ireland and the Reverend Jim Stephens, Parish of Kilcolman in the Church of Ireland Diocese of Ardfert & Aghadoe. The President and the Taoiseach were represented by their Aides de Camp. The attendance included the Mayor of Cobh, Sinead Sheppard, the Cork County, Mayor Barbara Murray, David Stanton TD, Michael Ahern, former TD, representing Mr Micheal Martin, Fianna Fail leader, Sean Kelly MEP, Cobh Junior Mayor Niamh O’Connor, and members of Cobh Town Council. Captain Hugh Tully represented Commodore Mark Mellett, head of the Irish Navy. The attendance included Garda Superintendent Pat Lehane, John Mulvihill MCC, Seán O’Connor MCC and people representing every parish in the diocese. Following the ceremony Bishop Crean attended a reception for the faithful of the Diocese of Cloyne in the Great Island Community Centre where he received a very warm welcome and many congratulations. Croí le brí Nua – heart with a new vitality is the simple motto I’ve chosen to represent this day and the journey that we, the priests and people of Cloyne set forth on from this day forward. Let me first extend a word of welcome and gratitude to all who have honoured us with your presence and prayer to-day, – first – my family and friends. We welcome all the parish representatives – and we have all the parishes represented. Welcome to the priests from the Diocese of Cloyne, from the Diocese of Kerry and my classmates from Maynooth and Rome. We welcome all the bishops who travelled to be with us to-day. 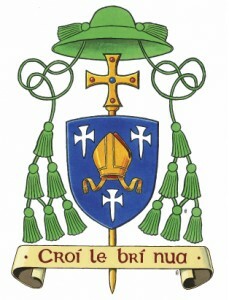 To Cardinal Seán Brady who has presided. To the ordaining Bishops. The Papal Nuncio Archbishop Charles Brown and his assistants Archbishop Dermot Clifford and Bishop Bill Murphy. As we make this new beginning for the Diocese I wish to acknowledge the ministry of my predecessor Bishop John Magee. In his absence we wish him well in his retirement. I also wish to acknowledge the diligent stewardship of Archbishop Dermot Clifford as Apostolic Administrator over these past years. Due to his oversight and direction a robust and comprehensive safeguarding policy and structure is in place throughout the diocese. We can be confident that best practice now prevails and will be subject to continual reviews. To-day I renew my commitment to continue the work of healing and reconciliation that is so necessary for all. This work will take time understanding and patience. As I begin my ministry as Bishop I am encouraged and affirmed by so many cards and letters from people priests and religious throughout the diocese, all have promised prayer and support. Each of these kind and thoughtful messages I will acknowledge. As we move forward we bring with us the long and deeply rooted Christian Heritage of this ancient See of Cloyne. Regardless of your view of history, St. Colman has set down deep roots – which will not be easily uprooted. “The Spirit of the Lord has been given to me”. We borrow these words from the lips of Jesus and make them our own today. Our mission is the same as that of Jesus – to ensure that the vulnerable are cared for. Few doubt that there is an air of desolation across the land. So much and so many things combine to dampen if not indeed crush the spirits of many. The discipline and demands of the “Troika” weigh heavily on us. Jesus was critical of those who placed excessive burdens on peoples’ shoulders. Is it not time that major financial institutions do more of the heavy lifting? – the people have done their share. Beneath these economic woes there are issues of the spirit that need more of our attention. Our souls cry out for “calm from the storm”. Anxiety and depression reign in the hearts of so many. Family relationships are strained to the limit as they try to cope. Despite these challenges we journey in hope and with resilience. This year we celebrate a Year of Faith to mark 50 years since Vatican II which gave us a renewed vision of the Church’s mission in the world. My friends when I speak of heart and the aspiration for a new vitality I speak not just of the Church but Society too. To nurture that spirit calls for a new positive engagement in public discourse. Cynicism serves no one and resolves nothing.